The chief executive of banking group HBOS, James Crosby, has said he will stand down from his post in July. He will be replaced by HBOS's chief operating officer Andy Hornby. 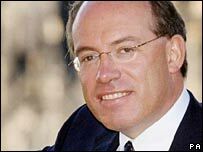 Mr Crosby became chief executive of the then Halifax building society in 1999, and headed up HBOS after the merger of Halifax and Bank of Scotland in 2001. "After more than seven years as chief executive, I believe the time is right for someone else to take HBOS forwards," said Mr Crosby. Mr Hornby held senior positions at Blue Circle and Asda before joining Halifax in 1999. Following the merger with Bank of Scotland, Mr Hornby became chief executive of the retail division at HBOS, and last year he was appointed chief operating officer. "I am very pleased to be taking over from James and am looking forward to the challenge," Mr Hornby said, who will take over from Mr Crosby on 31 July.